Damage pictures from the tornado that passed through Streator, IL can be found here. A copy of the NWS PNS statement can be found here. National Weather Service lead forecaster Gino Izzi and I covered the Magnolia to Streator damage and came up with high-end EF2. There were a few arguments for EF3 at a location in Streator where a 8" cinder block (with steel reinforcements) garage was partially destroyed. Given that all of the surrounding damage was indicative of EF2, Gino and I did not feel comfortable assigning EF3 in that location. East of Streator, there were 6 high tension power lines down. DOD/DI for these lines is low end EF3, but there were no structures to confirm any of this damage so I'm not sure if Gino is counting it. According to everything we can piece together (including reports from Paul Sirvatka) the low-level rotation was phenomenal with intermittent touchdowns. Maybe the velocities just off the surface were EF3 allowing the high elevation/tension wires to become susceptible. I've archived a bunch of data from the setup and hope to analyze it in the coming months after I finish working on my thesis. 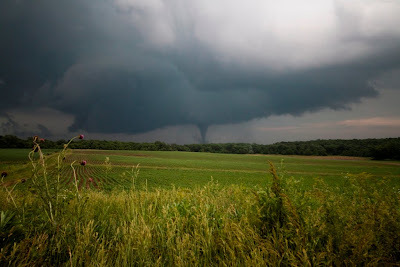 Witnessed the Elmwood tornado, although not from the vantage point that Walker did. I'm sure some are going to have some amazing pics/video. Thing was beautiful! Didn't get too close...instead stayed back and enjoyed the structure as storms were moving 40+ mph. Click here for a time lapse of some slow-moving weak convection just NW of McNabb, IL during the evening of 6/2/2010. Nothing too spectacular as it was weakening while approaching. I hope to do more night time lapse like this in the near future. Another trip west of Ladd, IL to shoot lightning out ahead of an approaching MCS.